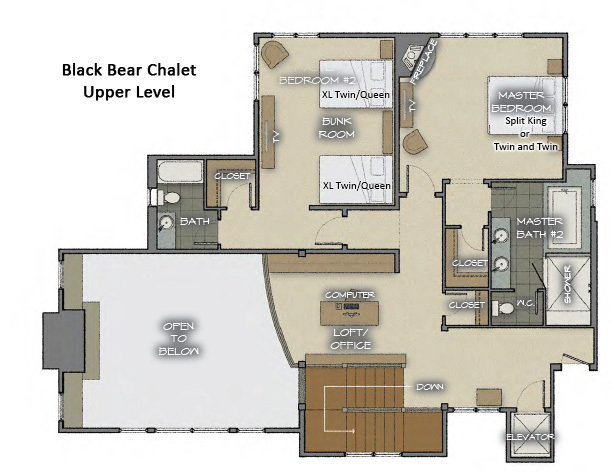 Black Bear Chalet can accommodate 12 guests in style in close proximity to the Thunderhead Express lift. Unique flexible bed configurations combined with the finest amenities make this home very appealing to a wide variety of groups. Walking into Black Bear Chalet, you will be drawn to the vaulted ceiling and open living room with great views of the Steamboat ski mountain. This luxury ski chalet offers a spacious great room with covered deck and mountain views. Leather sofas invite you to relax in front of the large fireplace and 45" plasma TV. The large open-plan kitchen is fully equipped and includes the finest appliances from Wolf and Sub-Zero. Custom alder cabinets and granite counters make a rich environment to inspire the creativity of any chef. The adjoining dining area features a handcrafted 10-person alder dining table that beautifully complements the fine craftsmanship of the interior woodwork. 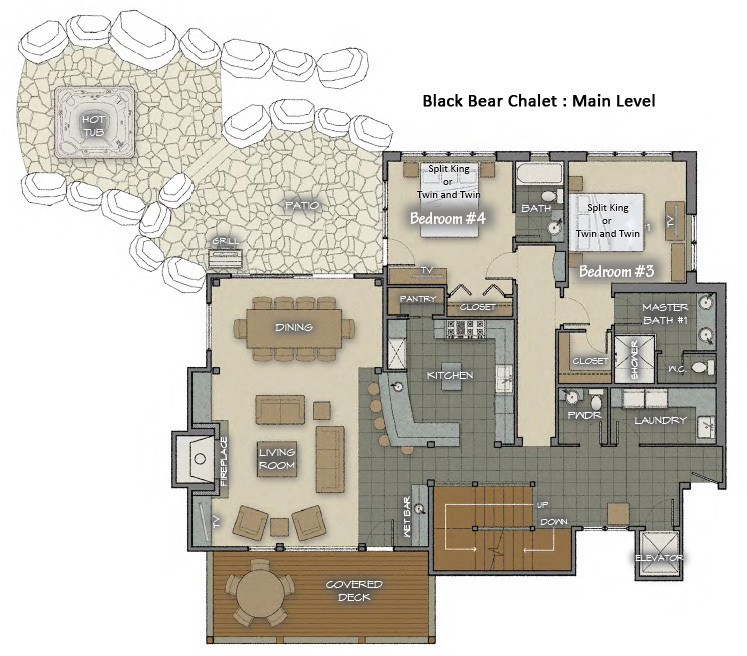 Black Bear Chalet offers 4 spacious bedrooms each with en suite bathroom. You'll find a Master bedroom and Bunk room on the upper level and a Guest Master and Junior Master bedroom on the main level. The recreation room on the lower level combines as a media and games room with a 50in big screen TV with surround sound, Sony PS2 video games and a pool table. There is also queen sleeper sofa and a bathroom with shower so it is a great space to sleep extra people. The separate mud room includes a boot dryer and storage cupboards for all your ski equipment. The chalet is equipped with an elevator serving all floors. Ski access is a breeze at the Bear Chalets as private shuttle service will bring you to the Thunderhead Express Chairlift in just one minute. We had a family reunion and stayed here. We felt the place was outstanding! The kitchen was equipped very well with anything you could possibly need, even an Nespresso machine! The toiletries were awesome and I would like to buy some to have at home! It was very comfortable, beds were great!! what a gem, great location!! This was our first stay in a rental home in steamboat springs and what a gem. We have been skiing in steamboat for several years and have been missing out. Black Bear was located down the road from Thunderhead lift and was a treat to begin and end our day at the lift versus the busy Gondola area. The home was beautiful and more than we could have asked for. We plan on staying here next year but in Black Bear and Brown Bear!! Moving Mountains Chalets provides an unparalleled experience in luxury skiing. I have been unsuccessful trying to find their level of homes and services in Vail, Deer Valley, or aspen. We were a party of 10 (two couples and 6 kids). The home we stayed in was spectacular. But what made the experience over the top were Elisabeth, Robin and their staff. We took advantage of the Full Service Catered Package which I highly recommend. It is actually quite reasonable when you do the math. The two gentlemen who took care of us went above and beyond in every little detail. The meals were fantastic, the presentation was that of a fine restaurant, not that of a home cooked meal. The two times we tried the "better” restaurants in town, we were sorry we had not eaten back at the house. They would cook anything and everything that we, or the kids, could desire. The house was always clean in spite of the six monsters we had running around. They drove us everywhere and anywhere regardless of the time of day, and fulfilled any and all of the stupid request the kids could come up with - they were beyond amazing! We planned this family ski vacation at Steamboat so that our grandchildren could learn how to ski. The chalet and Moving Mountain services exceeded our expectations in every way. 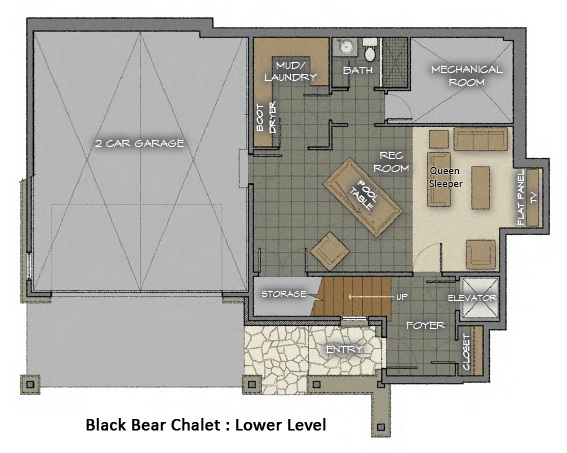 The Black Bear Chalet is beautiful, spacious, and so well designed--from the ski storage room--to the private elevator--to the 5 1/2 bathrooms--there was more than enough room for our children and grandchildren and us to relax and enjoy the gorgeous scenery outside our huge windows. Due to unexpected injuries, Papa and Grammy were not able to ski--but staying in the Black Bear Chalet made the non ski time so much more enjoyable. The Moving Mountains staff were so helpful and went out of their way to assist us---even sending over delicious cupcakes when they heard about our injuries. They quickly responded to all of our questions and made us feel so welcome. We are already talking about a return trip; everyone in our family so enjoyed the Chalet.